Happy Monday, everyone! 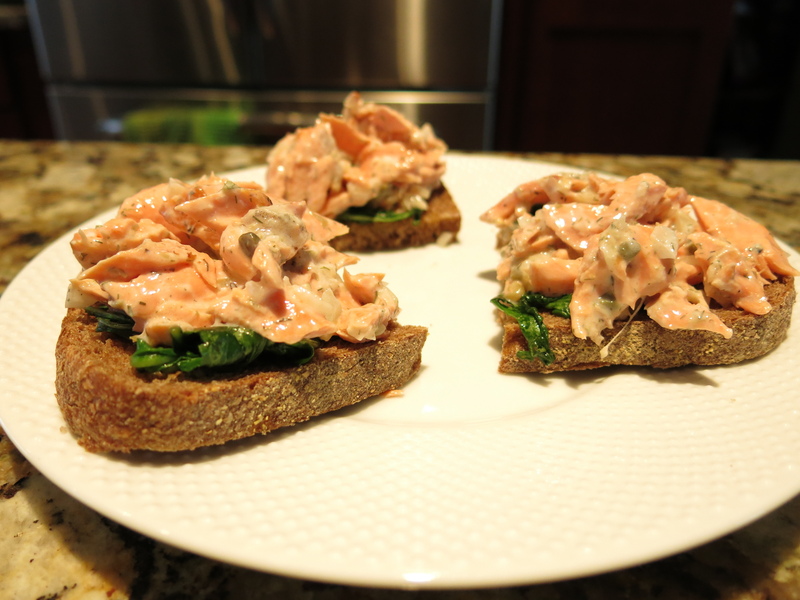 I’ve got another recipe for ya today: Salmon tartines. For those with an interest in nutrition, I’ve got one of those too. Salmon is one of those pregnancy super foods. It’s a rich source of omega-3 fatty acids, which promote neurological and visual development for your baby. It might also lower your risk of preterm delivery, preeclampsia, and postpartum depression. Are you breastfeeding or planning to do so? Omega-3s are also used after birth to make breast milk. Omega-3’s are great for you even if you’re neither pregnant nor breastfeeding. Before we go further, let’s step back. “Everybody” knows that omega-3 fatty acids are good, right? But just what are there anyway, and why are they important? Here’s the simple version. Omega-3’s are – wait for it – fat. Fats do important things, like give us energy and enable our bodies to absorb vitamins and minerals. Fats also build brains, make hormones, and make healthier skin. Fatty acids are the building blocks of fat. They come in two broad types: saturated and unsaturated. Consumption of saturated fatty acids is positively correlated with the risk of heart disease while consumption of unsaturated fatty acids is negatively associated with that risk. Omega-3 fatty acids and omega-6 fatty acids are two types of unsaturated fatty acid. They are “essential fatty acids,” meaning our bodies cannot make them; they must be acquired from the food we eat. Foods rich in omega-3 fatty acids include salmon, flax, and walnuts. Foods rich in omega-6 fatty acids include vegetable oils and peanuts. The problem with the diet of most Americans is that we consume too many omega-6 fatty acids relative to the amount of omega-3’s that we take in. In fact, the omega-6 to omega-3 ratio has increased substantially over time. The rise in processed food consumption helps explain this shift, since processed foods tend to be loaded with vegetable oils. When you consume too many omega-6’s and too few omega-3’s, you’re at a greater risk of developing a host of medical problems, including cardiovascular disease, diabetes, asthma, and cancer, to name a few. Conversely, you can reduce your risk of these conditions by increasing your relative omega-3 intake. So the next time you’re considering hitting the McDonald’s drive thru for dinner, stop at the grocery store and pick up some salmon instead. (And use it to make my recipe!). Oh, and if you’re pregnant and worried about taking in too much mercury, don’t be. The levels in salmon are relatively low and safe for pregnant women. When you find yourself at the seafood counter, try to get wild salmon, rather than farm-raised. Why? Because farmed salmon has a much higher omega-6 to omega-3 ratio. This recipe calls for coho, but feel free to swap it out for another type (e.g. king, sockeye), but avoid farm-raised if possible. There are also environmental reasons to opt for wild salmon (assuming it’s sustainably fished), but that’s a topic for another blog! Set oven broiler to high. Mix garlic with 1 tablespoon of olive oil and set aside. 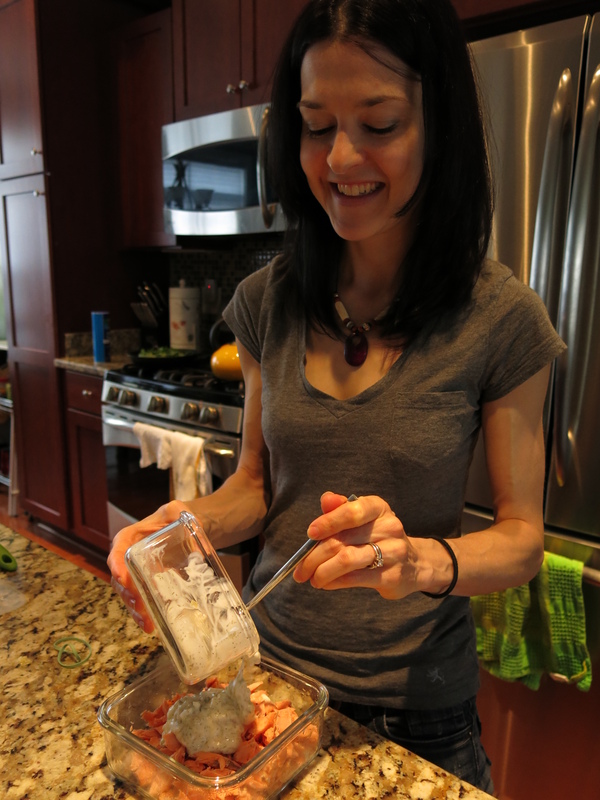 Whisk together yogurt, dill, capers, lemon juice, onion, salt, and pepper in a small bowl. Set aside. Brush salmon on both sides with ½ tablespoon of olive oil. Sprinkle fillet side with salt and pepper. When the oven is ready, broil the salmon for about 4 minutes on each side, or until the fish turns opaque. Remove from oven. Heat remaining ½ tablespoon of olive oil over medium heat in a large, nonstick saute pan. Add arugula and a dash of salt. Saute arugula until it wilts, about 2 minutes, and remove from heat. Cut bread in half. Brush the half slices of bread with the garlic-infused olive oil. Toast slightly under the broiler or in a toaster oven. When the salmon is cool enough to touch, break it apart gently, using your fingers. Stir the salmon into the bowl with the yogurt mixture. Top each piece of bread with equal amounts of the arugula and then equal amounts of the salmon. Previous postThanksgiving Guilt Be Gone Circuit!